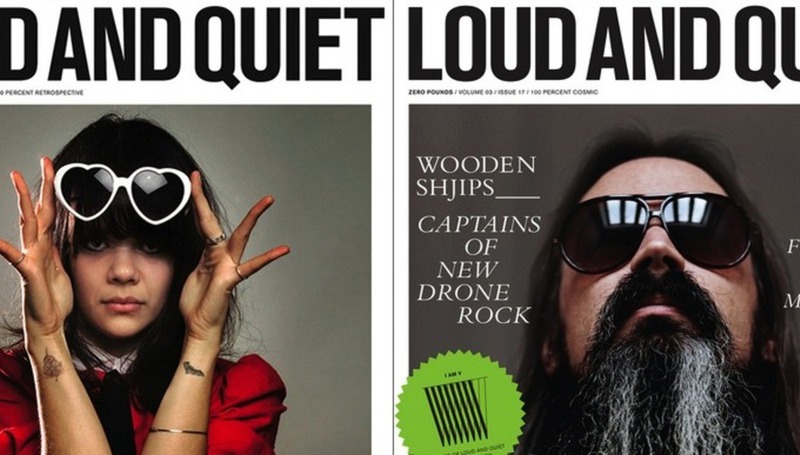 A free newspaper found in bars and shops across Britain, Loud & Quiet has made a name for itself with its cool, clean design and its dedication to new music. It really shouldn't work - advertising spend is going down and print costs are going up, but Loud & Quiet's snark-free approach is proving that where there's a will there's a way. When did Loud and Quiet start? Stuart Stubbs: The very first one was in January 2005. I made 150 copies on my home printer – it was a black and white fanzine, which I thought was brilliant at the time but after about two weeks I realised it was probably the most amateurish thing in the world. It’s had a few different incarnations over the years, and it’s been in the form it’s in now for about two years. That’s a pretty huge change in six years – what sort of consistency can you see from back then? The reason I started the magazine in the first place was because there weren’t really any magazines that had a lot of new music in them. That’s been the consistent thing –in that very first issue it was newer bands all the way through. Also, I really like the look of a lot of fashion magazines but I don’t really like the content; they have more style than substance. But the idea for Loud and Quiet was always to combine those two. It’s grown pretty slowly because we never had any money to put into it – we just paid for it on my credit card – but now it’s got to the point where it’s in a very healthy place. And you’re a free magazine too – everyone knows that it’s incredibly difficult selling advertising in magazines at the moment, but you seem to be doing alright at it. Unfortunately I think the only way to launch a magazine or make one that succeeds is by not charging for it. Since the internet has come along everybody wants everything for free, and not just editorial content; people want their records for free. Even now most of the shows, in East London at least, are free shows; people don’t even want to pay to go and see the band. In the middle of all that advertisers seem to have cottoned on to the fact they are better off advertising within the independent press because it’s more relevant for the people that will eventually buy the records. More and more people are coming round to the idea that it’s better to be part of something smaller, that people are actually picking up, rather than something that’s more mainstream but no-one’s buying it. Does it worry you that people don’t want to pay for music? Surely that must be bad news if you’re making a magazine about music? I’m not sure… it’s something that I constantly ask myself. Do people really care what we think about these records and these bands? Ultimately now everyone’s got a blog and everyone’s a critic, so in a sense, why should anyone pay for a magazine? But I think with the free music press and independent websites it’s more of a niche thing. I think the audience is still there but it’s something that I constantly question; is the service you’re giving worthwhile? I think at the moment it still is and maybe it always will be because some people will always be interested in what bands do and why they do it. And the only way you can really find that out is by talking to the bands, writing an article and giving them a platform. So where do you go from here? What are you looking forward to next year? That’s a good question. We’ve hit this point where we think, ‘What are we going to do next year?’ This time last year there were murmurings of taking the magazine to Japan, which we finally did last month. In Japan they have a few decent music magazines but they don’t have any underground ones that represent alternative music, so that was our big project this year – launching in Japan. Are you actually selling it or is it free over there as well? It’s being sold over there in a few places. We’ve launched it on a small scale to see how that goes and hopefully we’ll pick it up a bit if people are into it. So next year we’re trying to build up in Japan but also here. Over the past two months we’ve expanded out of London to Manchester, Sheffield and Leeds and we’re going to expand further, but doing something without loads of money is tough. This year’s been really good – we’ve upped our print run and we’re looking to keep doing that next year and getting it into more places. You sound pretty optimistic about the future. A free music magazine is an odd thing, especially in a digital age, because you never know when people are just going to drop it. It is a niche thing and there does have to be a ceiling. It’s just a question of finding out where that ceiling is, and we’ve not found it yet so that’s great. So is this a good time to be writing about music? Yes, I think it is, because there’s a lot of music out. It seems like everyone’s in a band and as much as that creates a lot of crap it also creates a lot of good things… or maybe a few good things. I think that’s the difference between a good magazine and a bad magazine. It’s kind of filtering out the crap because there is so much of that now – it’s almost the reason why magazines have become relevant again. If you have to consolidate everything into 50 pages you’re only going to put the best stuff in there. For more about Loud and Quiet, visit loudandquiet.com.